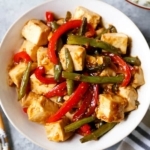 A sweet, savory and spicy Chinese-American tofu stir fry you’ll have on the table in 17 minutes! Wrap tofu in a kitchen towel and let sit for 10 minutes to drain. Mix all the ingredients for the stir fry sauce and set aside. Cut tofu into 1-inch cubes and set aside. In a large pan over medium high heat, add oil, green beans and red bell peppers. Cook for 3-4 minute, or until vegetables are tender but still yielding a crunch. Add garlic and ginger and cook for 2 minutes, until garlic becomes fragrant. Add tofu and sauce and cook for 2-3 minutes, until tofu is warm and sauce has thickened. Store leftovers of this honey ginger tofu stir fry in the fridge for up to 2-3 days.